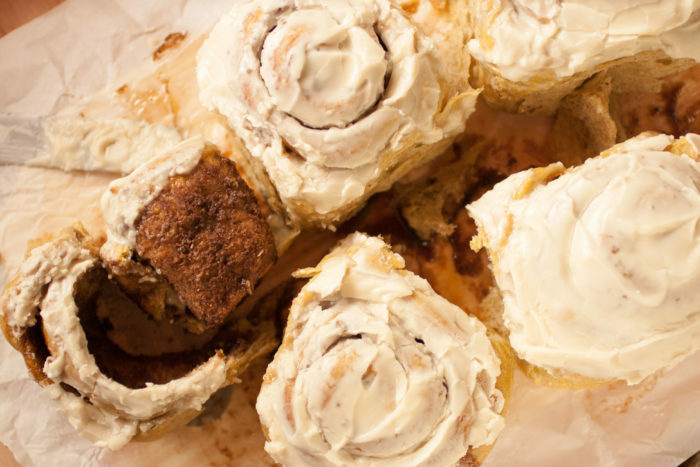 These pumpkin cinnamon rolls are super fluffy and they just melt in your mouth. Hard to stop at one. 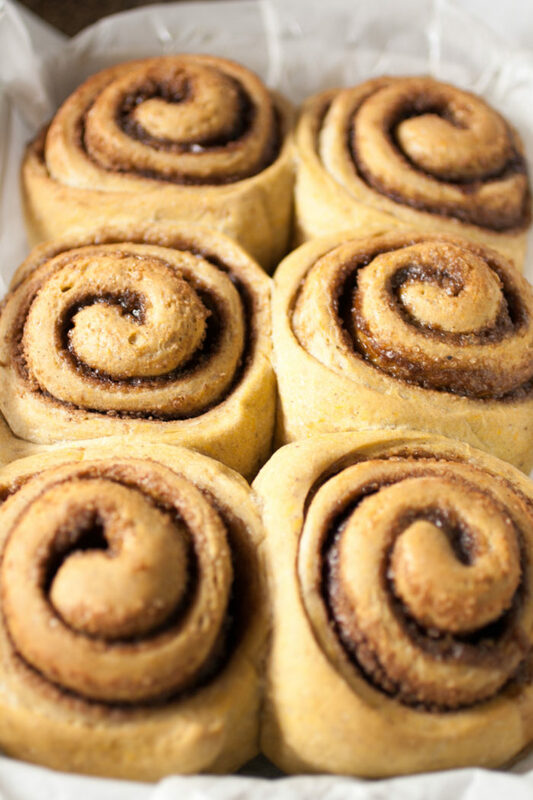 Cinnamon rolls are made with a yeast dough, which is rolled out and smeared with a good amount of butter. 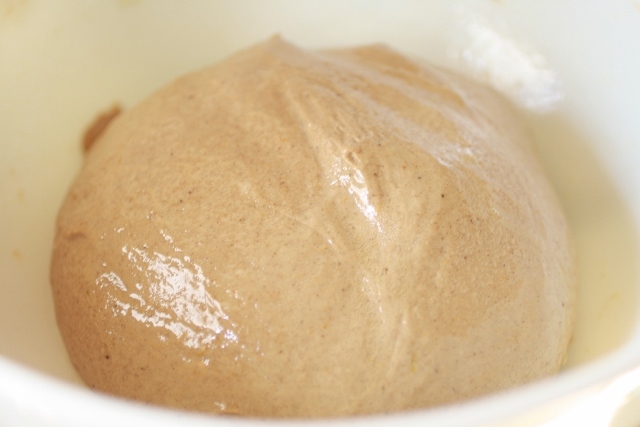 A mixture of sugar and cinnamon is spread over it. The dough is rolled and cut. 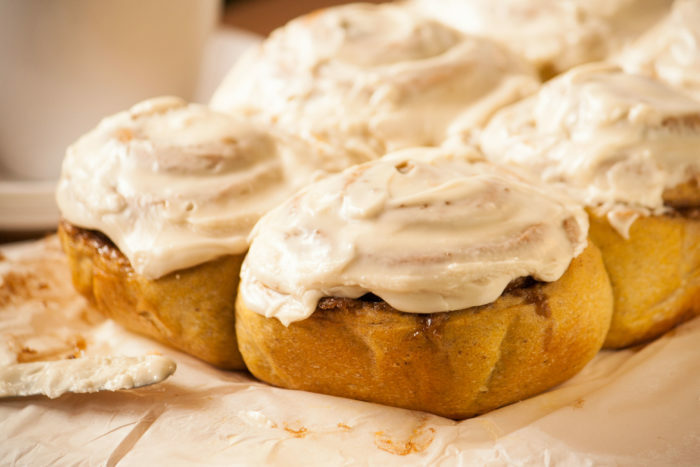 Once these cinnamon rolls are baked and still warm, a delicious cream cheese icing is spread all over them. In this recipe we are using some pumpkin puree in the dough with cinnamon, cloves and nutmeg. This combination of flavor is very common in pumpkin pie, a pie I’ve eaten many times in the USA during the fall. In Paraguay I use butternut squash because is a little bit sweeter than the other kinds of squash I can find here. There are several ways to cook pumpkin for these fluffy pumpkin cinnamon rolls. You can peel it, cut it and cook it with a little bit of water in a saucepan over the stove; you can bake it in the oven or in the microwave and this is what I do. Cut it in half, take the seeds out, wrap it with film and microwave it for about 8 minutes. Once cold, take the pulp out of the skin and mash. I like doing it like this because it is fast and it doesn’t absorb any water in the process. Because I can’t use all the puree, I measure the rest and freeze it for the next time I need it. It is important to have all the ingredients at room temperature before you start, and have everything measured. Once you mix the ingredients for the dough, you need to knead it. Either by hand, or with the help of a machine. 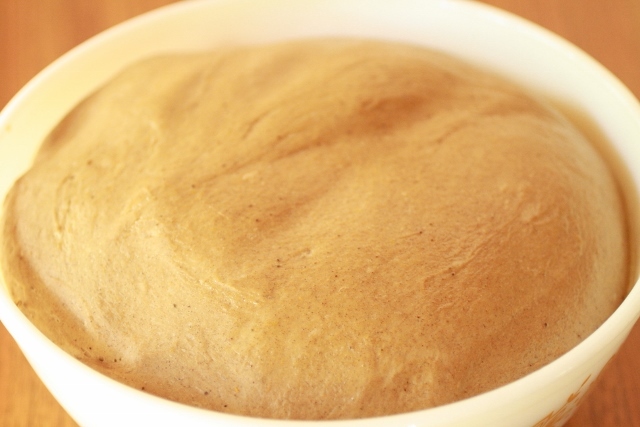 If you have a bread maker, you can add all the ingredients according to the manual and use the dough option. Once it’s ready, you can roll it out. Put the dough on a flat surface and flour your hands. This dough will be a bit sticky, so the flour will prevent it from getting stuck to your hands. Do this every two minutes or every time you feel it too sticky. When working with this dough, I prefer flouring my hands rather than sprinkling it on the countertop. After kneading for 10 minutes, place the dough in a greased bowl (use neutral, vegetal oil), flip the dough to cover it in oil, and cover with plastic film. Set aside in a warm place. I generally leave it in the laundry room. This time, I let it rise for an hour. When the weather is cold, it takes between an hour and a half and two hours. It will be ready by the time it has doubled its size. After rolling out, filling and cutting the dough, it needs to rest once more before baking. In about 25 to 30 minutes these pumpkin cinnamon rolls are ready. Make some delicious cream cheese icing to spread on top. Of course you can serve them without any icing too. But you won’t regret spreading a thick layer of icing. Look at it! The bread itself is not very sweet. So the icing goes perfectly well with all those warm pumpkin-cinnamon flavors. 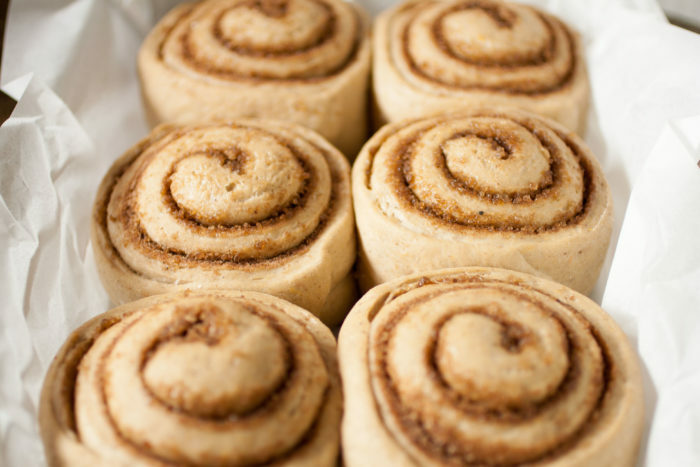 I hope you add these fluffy pumpkin cinnamon rolls to your baking list for this weekend! 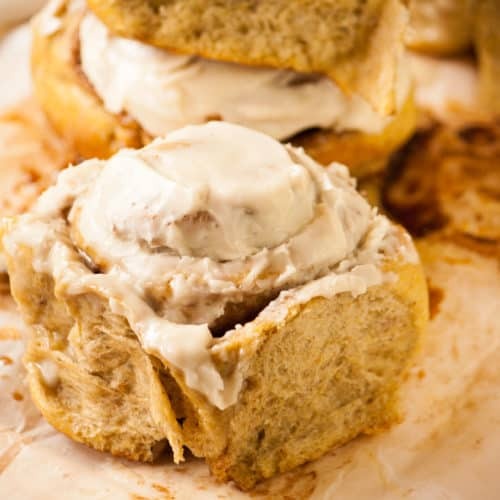 Fluffy, melt in your mouth cinnamon rolls. In a big bowl, mix sour milk, double cream or butter, egg, pumpkin puree, brown sugar and yeast. Add the rest of the dry ingredients. Put the dough on a flat surface and cover your hands in flour. This dough will be a bit sticky, so the flour will prevent it from getting stuck to your hands. Do this every two minutes or every time you feel it too sticky. When working with this dough, I prefer to flour my hands rather than sprinkling it on the countertop. Knead for 10 minutes. Place the dough on a floured flat surface and roll it into a rectangle (about 50x30cm / 18”x11”). Spread butter on it (I used my fingers) and sprinkle the cinnamon and sugar mixture. Roll the dough and pinch the two ends to seal. Using a sharp knife, cut into 12 equal portions. Put the rolls in a greased baking pan; cover it with plastic wrap and let rest for 30 minutes. My oven takes about 15 minutes to reach 175ºC/350ºF, so I preheat it considering the 30 minutes rest the dough needs. 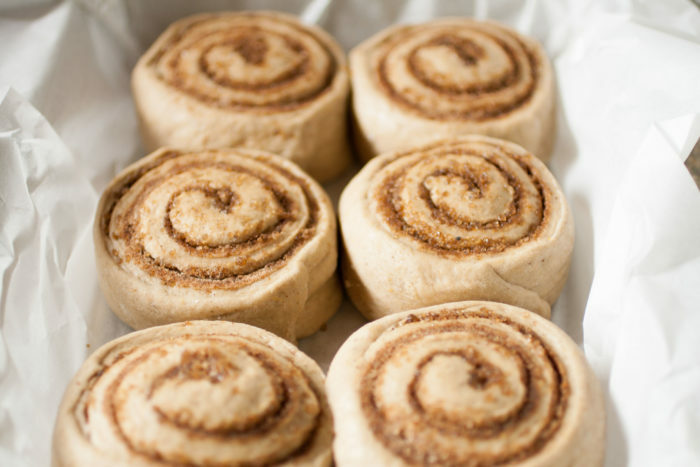 Bake the cinnamon rolls for 25-30 minutes. Keep at room temperature up to 3 days, or keep in the refrigerator for up to 7 days. Happiness is Homemade, hosted by Susan at Crafting a Family. 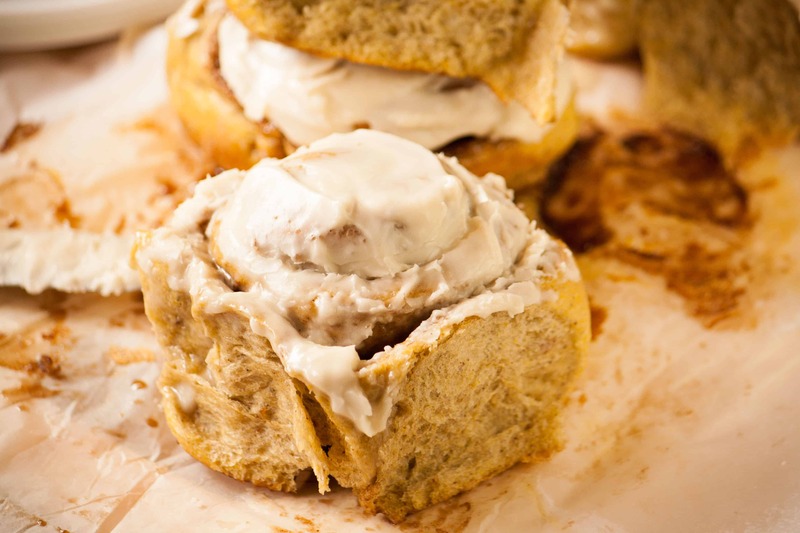 These pumpkin cinnamon rolls are just perfect! Beautiful, delicious and perfect for fall. Thank you for sharing at Meal Plan Monday. 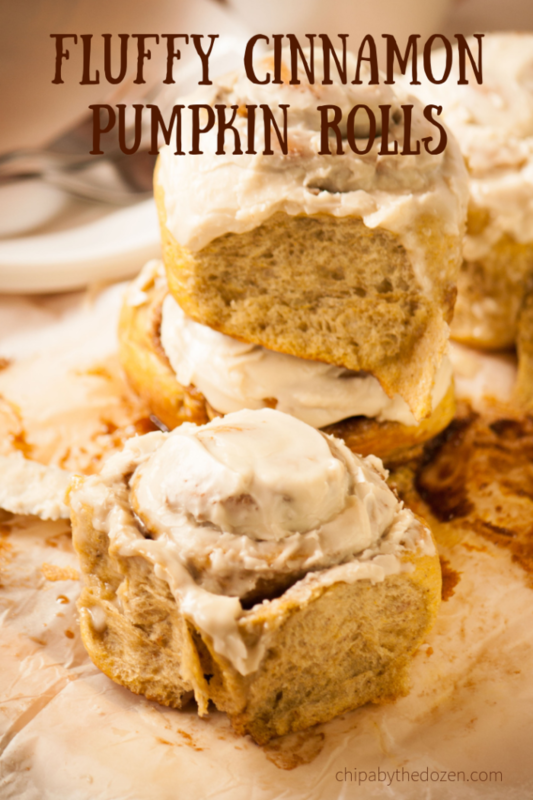 These pumpkin cinnamon rolls sounds so delish & interesting. 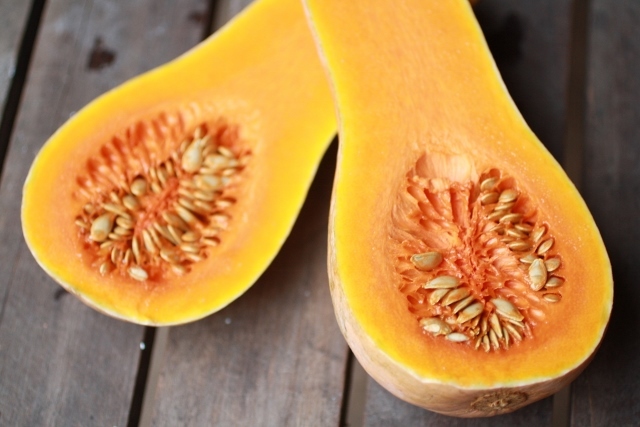 I particularly love the flavours of pumpkin & cinnamon when they are in together in a dish. And also perfect for this fall season. Thanks for sharing at Fiesta Friday! Yes, great for this fall! 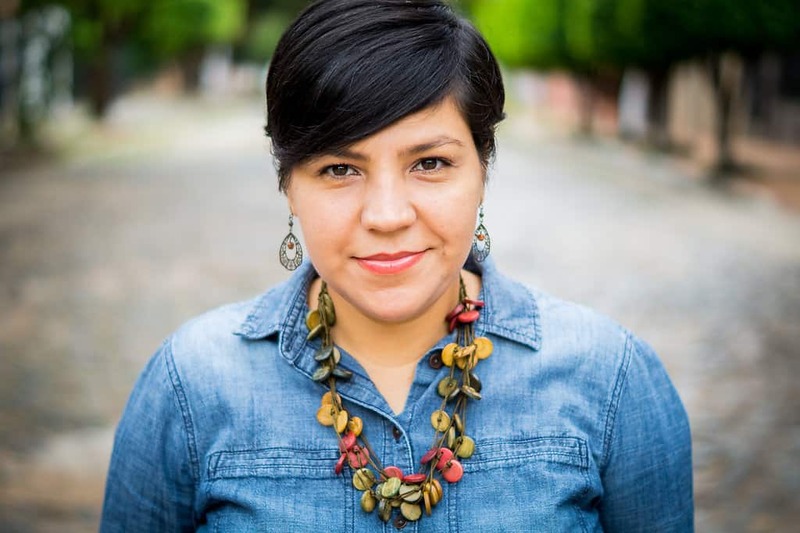 Thanks Debanita for co-hosting! What a great combination. They look so good! Thanks Susan! 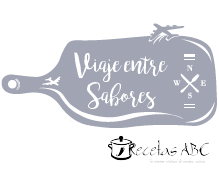 I’ll go and check it out! I may be more of a apple/cinnamon type of gal but your pumpkin cinnamon rolls sure make me wish I had one for breakfast this morning. I use to make my pumpkin pies using real pumpkins – fun thing to do but time consuming. I always thought they tasted better but then the popular American chef Ina Garten said there was no difference between fresh and the canned variety. Go figure. Thanks for sharing with the gang at Fiesta Friday! Thanks Judith for coming by. Interesting about canned and fresh pumpkin. I would’ve thought fresh was always better. Ohhhhh… So good. Loved them!